As digital marketing experts, we always recommend that our small business clients incorporate a blog on their company website. There are many benefits to having a blog as part of your digital marketing strategy such as establishing a positive rapport with customers, sharing information about your company, showcasing the personality behind your brand, and attracting new customers. A good blog can help pull in search engine traffic to your website and we’re here to tell you exactly how that’s done. Here are some ways to search engine optimize your blog. First things first. Head over to Google’s ‘Add a URL’ page and fill out the form to let the search engine know your blog is live. This will send an alert to Google’s search engine bot to crawl your site. Ideally, this would help your blog get indexed on Google’s search engine faster. Another way to let Google know your site exists is to open a free account with Google Webmaster Central. There you can submit a large list of URLs including a sitemap file and verify that you own your site. This allows for faster indexing and it’s free! Likewise, you can do this with Yahoo. Submit your blog with Yahoo Search Engine here. Although Yahoo isn’t as popular as Google, it still is responsible for sending about 11% of search engine traffic to websites in the United States. Don’t forget Microsoft’s Bing, which also can bring search engine traffic to your website. You can submit your URL to Bing here. Keyword usage is a huge factor when it comes to optimizing your blog for search engines. Afterall, that’s how searches are initiated, by typing keywords into a search bar. For this reason, you should focus a significant amount of effort on building your posts around keywords. But not just any keyword. Strategically selecting the right keywords that will perform well on your site is paramount to a good SEO strategy. You need to figure out which search terms prospective customers are using to answer their questions and find solutions to their needs on the internet. An important part of your strategy should be to write blogs using these strategic keywords and search terms that will answer their questions and provide solutions to their needs. For example, product comparisons, how to articles, local line-up of resources, and product demonstrations are great ways to attract prospective customers to your blog. Also, using the name of your city along with your keyword can boost search engine traffic tremendously. For example a fitness gym in Boston would see significant search engine activity if they were to write articles centered around ‘Boston Fitness Gym’. There are many ways to incorporate keywords into your blog. In fact, employing a combination of these tactics will give your blog the best chances at reaching the top of search engine results. Another way to incorporate keywords into your blog would be to include them in the titles of your blog posts and in the sub-titles. You should also include them in individual URLs of each post as well as in the titles and description tags of your images. Faster loading sites are search engine favorites because they help the user find what they are looking for the quickest. Make sure that your site is fast loading. Also, since more and more users are using mobile devices, search engine algorithms have given websites that are mobile responsive more priority. Therefore, your site also needs to be mobile responsive, meaning that it adapts to any device including mobile phones and tablets. There are a lot of things you can talk about on your blog. The sky’s the limit to the type of content you can include. The more information you share on a consistent basis, the better you can position your blog on search engines. Also, don’t forget to incorporate keywords into each of your blog posts. The beauty of a blog is that, your content will continue to work for you even after years go by. In fact, it gets better with age. 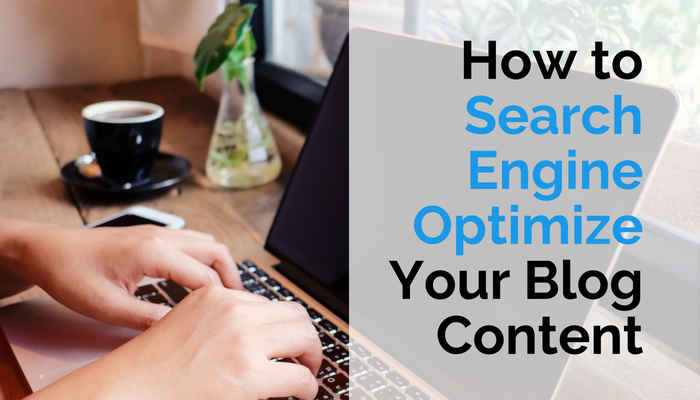 Using these tips will help you optimize your blog to get more search engine traffic so that you can generate more leads for your business.